Don Heinrich Tolzmann, “The Directory of the Covington & Cincinnati Bridge Co.: Roebling’s Address and Memo Book,” Bulletin of the Kenton County Historical Society. (July/August 2015): 7-9. Don Heinrich Tolzmann, "Wilhelm Hildenbrand (1843-1908): Chief Engineer for the Reconstruction of the Roebling Suspension Bridge," Bulletin of the Kenton County Historical Society. (March/April 2015): 1-5. Don Heinrich Tolzmann, "The Steuben Regiment: A German Regiment from New York in the Civil War," The Palatine Immigrant, 40:1 (2014): 19-26. Hermann Welp and Monika Thölking, "Off to New Shores: German Immigration to Cincinnati from the Osnabrücker Nordland in the Early 19th Century," Translated and edited by Don Heinrich Tolzmann. The Tracer. 35:4 (2014): 98, 112-16. "Washington Roebling (1837-1926): Man and Myth," Bulletin of the Kenton County Historical History. (November/December 2014): 6-10. Don Heinrich Tolzmann, "Charles Stolzenburg (1867-1903): A Stone Mason Carves His Name into History on the Roebling Suspension Bridge," Bulletin of the Kenton County Historical Society. (July-August 2014): 9-10. Don Heinrich Tolzmann, "Remembering World War I," Germerica.com. (February 3, 2014) and reprinted in: German-American News. 20:2 (2014) and: German-American Journal. 62:3 (2014): 5. "Oldenburg, Indiana," German-American Hall of Fame/GAMHOF, No. 9 (2014). "Wilhelm Pfaender, A German Forty-Eighter and Turner Leader in Germany and America," The Palatine Immigrant. 39:2 (2014): 18-23. "The Germanic Museum at Harvard University," German-American Journal. 62:1 (February/March 2014): 5, 8. Book Review, German-Americana: Selected Essays, in: Concordia Trust Newsletter. 10: (2013). "Muench-Related Works," Muench Family Association (20 December 2013). Publications about German-American author Friedrich Muench. "The Germanic Museum at Harvard University," German-American Hall of Fame/GAMHOF. No. 8 (2013). "The German Forty-Eighers: A 165th Anniversary Assessment," Moin-Moin (December 8, 2013). "Yearbook Stoltenberg & Dr. Henry Kissinger," Moin-moin: Dedicated to US 1848ers from Schleswig-Holstein and Europe (November 13, 2013). "Roebling Heritage Tour: A Guide to Sites Related to John A. Roebling (1806-69) and His Bridge on the Ohio at Covington, Kentucky," Bulletin of the Kenton County Historial Society (November/December 2013): 5-8,11. Mark Silbersack, "February Presentation (by Don Heinrich Tolzmann on the Great Sioux Uprising of 1862 in Minnesota)," The Canister: Monthly Newsletter of the Cincinnati Civil War Round Table (March 2013): 5-6. Brent Coleman, "Architectural Jewels dot Over-the-Rhine," Cincinnati Enquirer (24 May 2013). Andreas Schumacher, "German Brewing Culture in Cincinnati," German Life (June/July 2013). A review of: Christian Moerlein: The Man and His Brewery. For a longer review by the same author, see: “German Brewing History in North America,” The Hofbräuhaus News (April/June 2013): 3. Clara Harsh, Book Review of: The Cincinnati Germans after the Great War, in: The Palatine Immigrant. 38:2(2013): 3-4. Clara Harsh, Book Review of: Christian Moerlein: The Man and His Brewery, in: The Palatine Immigrant. 38:2(2013): 4-5. Antonius Holtmann, "Over-the-Rhine Tour Guide: Cincinnati's German District," Amerika-Woche (28 January/4 February 2013). Don Heinrich Tolzmann, "MainStrasse Village, Covington, Kentucky," German Heritage in America: Towns, Villages and Sites. No. 5 (2013). Rick Armon, "Five Questions with Don Heinrich Tolzmann," The Beer Blog (August 20, 2012). About: Christian Moerlein: The Man and His Brewery (Little Miami Pub. Co., 2012). Colleen Phillips, Book Review of: Over-the-Rhine Tour Guide, The Tracer, 33:2 (2012): 60. 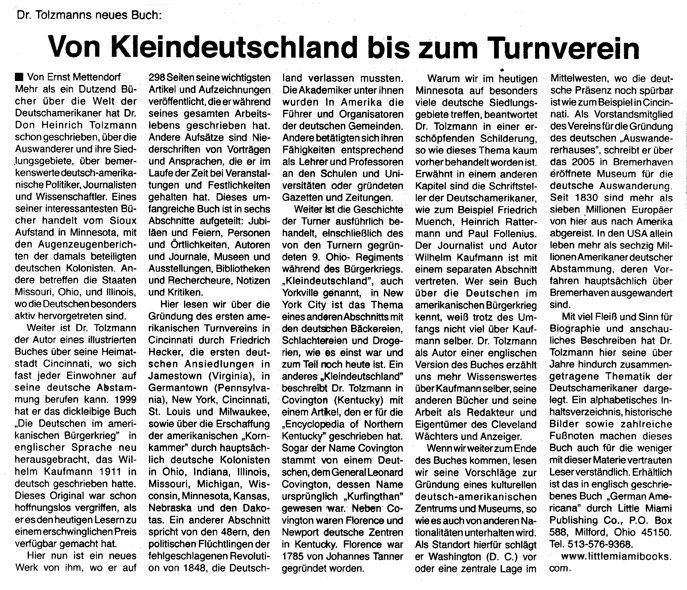 Don Heinrich Tolzmann, "John Hauser - A Cincinnati German Artist," Amerika-Woche (18/25 June 2012). Robert Grandchamp, Book Review: The Cincinnati Germans in the Civil War, Blue & Gray Magazine Vol. 28:6 (2012): 31-32. "New Ulm, Minnesota," by Don Heinrich Tolzmann, German Heritage in America: Towns, Villages and Sites No. 2(2012). Hans A. Pohlsander, "Dr. Don Tolzmann's New Cincinnati Book: Over-the-Rhine Tour Guide," Amerika-Woche (4/11 June 2012). "Recent Books on German-American History," by Don Heinrich Tolzmann, Amerika-Woche (9/16 April 2012). Randall P. Donaldson, Book Review: German-Americana: Selected Essays, in The Report: A Journal of German-American Studies, 46(2011):136-38. Andreas Schumacher, "Perpetuating Southwestern Ohio's German Heritage," Amerika Woche, (2/9 Jan. 2012). Dr. Richard Hartle, "Fall Seminar Recap (German Immigration, Settlement and Contributions," Palatine Heritage 34:4 (2011). Andreas Schumacher, "New Insights: German-American Contributions to the Civil War," Amerika-Woche (24/31 October 2011). "GAMHOF Honors Siegfried & Roy," Germerica.net (26 October 2011). Book Review: "The Cincinnati Germans in the Civil War," Ohio Civil War Genealogy Journal 15:3(2011): 119. Barbara Keyser Gargiulo, "Dr. Don Heinrich Tolzmann - An Introduction," Palatine Heritage, 34:3(2011): 38. "Baron von Steuben: From Prussian Soldier of Fortune to Inspector General," by Don Heinrich Tolzmann, The Palatine Immigrant 36:1(2010):26-32. "Proud of His Heritage(Gustav Koerner)," 12 August 2010. "Author of Numerous Works Speaks on German Immigration, Heritage," by Brandon Drake. Daily Chief Union (Upper Sandusky, Ohio), 10 July 2010. "Denison Conference Dedicated to German-American Henry Finnern," ASHHS Newsletter 22: 1(2010): 7.
Review of Wooden Shoe Hollow: Charlotte Pieper's Cincinnati German Novel, edited by Don Heinrich Tolzmann, By Clara Harsh, The Palatine Immigrant, Vol. 35:1 (2009): 5-6.
Review of German-Americana: Selected Essays, by Petra DeWitt, Der Maibaum 17:3 (2009): 3. "The Legacy of 1848," Amerika Woche (February 16/23, 2009). Book Review of John Roebling and His Suspension Bridge on the Ohio River, Yearbook of German-American Studies, 42 (2007). Book review from: Steuben News. Vol. 8:4(2007) The Army of the American Revolution and Its Organizer: Rudolf Cronau's Biography of Baron Von Steuben. Review of John A. Roebling and his Suspension Bridge, by Clara Harsh, The Palatine Immigrant. 33:1(2007): 31. "Dr. Don Heinrich Tolzmann Honored in Cincinnati," Amerika Woche (October 29/November 5, 2007). "Author explores life of Suspension Bridge builder," by Kurt Backscheider, Community Press & Recorder (October 9, 2007). "John A. Roebling Story," by Sara Pearce, Cincinnati Enquirer (August 9, 2007). "Fürsprecher seiner Herkunft," Das Fenster (August 2007). "Society for German-American Studies Outstanding Achievement Award for 2007 - Don Heinrich Tolzmann,"
Society for German American Studies Newsletter (June 2007). "Auf deutschen Spuren in Cincinnati," German Life (2006). "The 'Book Barons' of Cincinnati," Source, University of Cincinnati Libraries [website] (Fall 2004). "Anniversary Volume Gives New Voice To Pioneer Accounts of Sioux Uprising," University of Cincinnati News [web site] (August 21, 2002). Review of Kentucky's German Pioneers: H. A. Rattermann's History, by Genevieve Myers Hill, Northern Kentucky Heritage. 8: 2(2001). "PBS program reaches out to UC German American experts," University of Cincinnati News [web site] (February 28, 2001).